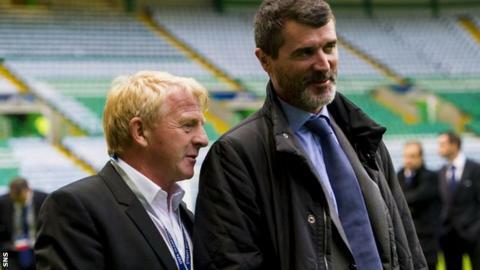 The impact of Roy Keane will still be felt by Celtic, even though he will not become the club's next manager. It is unlikely that any subsequent candidate will match Keane's high profile and the status that would have obliged a wider audience to train their attention on Celtic Park. In sounding out Keane and Henrik Larsson, Celtic signalled an intention to seek a manager who will generate public interest. Season tickets are being sold, after all, and there are also Champions League qualifying matches at Murrayfield - while Celtic Park is being utilised for the Commonwealth Games - to attract fans to. Coaching and managerial attributes still need to underpin the decision-making process, but Keane or Larsson might also have rejuvenated the commitment of the Celtic support. Even so, other candidates might arguably be better suited to the club's management structure and recruitment strategy. Keane's decision to remain with the Republic of Ireland is uncomfortable for Celtic. Inside the club, the insistence was that no job offer was ever made, although the view in Ireland was firmly that the position was Keane's if he wanted it. Either way, he has rejected the opportunity to manage Celtic in favour of retaining an assistant's role with the Irish. It is understood that an English Premier League club was also eager to offer Keane a role as a number two, but there seems no prospect of him taking that opportunity either. Celtic, whose chief executive, Peter Lawwell, is heading to to Vienna for a European Club Association meeting, will maintain the stance that various candidates are being assessed. Keane has to stand alone, though, since he is the only potential new manager to have held discussions with the majority shareholder, Dermot Desmond. An initial conversation early last week was followed up after the Irish played Italy at Craven Cottage on Saturday. The view in and around the Irish camp seemed to be that Keane was almost certain to leave. The turn of events is troubling to Celtic, because it prompts speculation as to why Keane decided to stay with the national side. He is, though, believed to be happy in the role and was struck by the commitment of the players against Italy but also the reaction to his potential departure. Celtic's pursuit of a new manager is becoming a test of patience. There is no wish to appear hasty when the decision is so critical, but it is six weeks before the first of the Champions League qualifiers that they need to negotiate. As well as the demands of the calendar, the process is in danger of becoming drawn out. Speculation is an inevitable consequence of the search and Celtic prefer to be wholly discrete, so potential candidates will not discuss their options. The talks with Keane became public knowledge, though, when the Republic's manager, Martin O'Neill, revealed them at a press conference last week. Now, Celtic appear to have been rebuffed, even if the club insist that no offer was made. Other candidates will now appear alternatives to Keane, although a number of people have been under active consideration since Neil Lennon departed. Steve Clarke is the fourth individual to become the bookies' favourite - after Larsson, Owen Coyle and Keane - and, as an experienced, established coach who has operated at the top level with Chelsea and has excellent contacts in England, Clarke would be a wise choice. He is also thought to be in the running for the managerial vacancy at Brighton, along with another potential Celtic target in Malky Mackay. The latter fits the bill in the same way but would also like another shot at managing in the Premier League in England. Celtic are a major club restricted by their circumstances. Brighton and Southampton, another club currently seeking a manager, cannot call upon crowds of 60,000 or access to the Champions League, but English football is considered a more glamorous and rewarding environment. As Lennon has discovered, winning titles in Scotland and even reaching the group stages of the Champions League does not guarantee that top-level English clubs will offer jobs. The opportunity at Celtic Park remains, though, a coveted one. There are contradictions when candidates with such varying attributes are being considered. Keane is a manager in the sense that he works by building teams through acquisition and driving up standards by his own work ethic and demands. He is not a renowned coach, nor is he considered the type of manager who would improve a team's tactical nous. Yet that is the ideal candidate for Celtic, since the club's strategy has been to sign players with potential to develop them into saleable assets. There is time, though, for Celtic to identify the right candidate to succeed Lennon. There were obvious attractions to the potential of appointing Keane, but a better fit can now be found.